Charles Doran‘s hilarious ode to Los Angeles geography snobbery, Westsider, is at last available in a spiffy DVD package that includes two versions of the film with behind-the-scenes material, as well as Doran’s earlier film, Ennui. You can order the DVD on Amazon or watch the original version as an Instant Download. While Westsider is clearly very L.A.-specific, its attack on neighborhood superiority is a universal one, e.g. just ask any Manhattanite if they’d ever consider living in Brooklyn. The DVD comes with the version of the film that screened at numerous film festivals, plus an extended version that runs a little over a half-hour. For the bonus material, there are several audition tapes for the two main leads, Will Lupardis as the architect and Nikki McKenzie as his trophy girlfriend, and a making-of slideshow from the set. 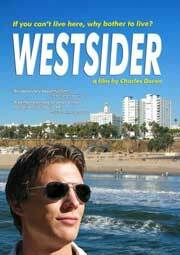 The Underground Film Journal has seen and praised the “festival” version of Westsider numerous times and the new extended cut only improves on the original, rounding out the story a little bit and giving more time to soak in the gorgeous 8mm camerawork of cinematographer Laura Daroca. What really stands out in the longer version is the differences in the photography when the film shifts from the beach communities, shot in extremely crisp color, to the valley, shot in a washed-out yellow that makes the film look like it was processed using genuine L.A. smog. The bonus material audition tapes prove to be extremely compelling. While the movie is shot with non-synchronous sound and a constant voice-over narration by Lupardis, in the actor’s audition we get to see him actually talking in character. It’s obvious to see why Doran cast him as Lupardis perfectly nails the pretentious, self-assured nature of the architect. Then, when matched with Nikki McKenzie as his girlfriend in the auditions, their chemistry is natural making them easily believable as a couple, from their improvised “first date” to the bedroom argument we see in the film. It’s extremely fascinating seeing the level of emotional realism that went into the planning the film, which really comes out in the final product. Lastly, just so one doesn’t think that Doran is a geographic snob about which side of L.A. he likes to pick on, he’s included his earlier B&W short Ennui about a clueless east side art girl. Ennui is as ruthless as Westsider, but insulting to a whole different set of pretensions. As a fan of both films, the Underground Film Journal is thrilled that they’re finally available in such a great package.